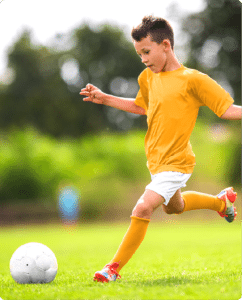 Welcome to the 2019 JCC Chai Sports House League and Introductory Soccer Programs. Our house league program has been operational since 2009, and over 3,000 participants over that time period. Early bird Registration for house league soccer opens on March 1st, for all of the programs below. Our programs are led by instructors, who are thoroughly trained by our Technical Director and their senior staff. These staff members will follow and teach a curriculum that is catered to improving the skills and development of each player, in a recreational setting. This is a once a week program that has been created and priced in the house league style, and is not a Rep/Elite program. Uniform (jersey, shorts and socks) and soccer ball, end of the year tournament and/or festival, trophy or medal. Parent-Tot program. Parent participation is required. Kids this age will require assistance from their parents as needed. Parents must be prepared to participate with their child in various activities and drills. Thls is an Introductory program, It Is Intended for player development and we do not keep scores, stats or standings for this age group. Other Thornhill fields may be added for make-up dates. The program will begin on the week of May 27th and will run for 8 weeks. Start times are not guaranteed to be the same every week as this is a traditional house league. Teams will play different teams each week. A schedule will be released prior to the start of the season. All fields are within close proximity of each other. Volunteer coach also will be trained, certified and will assist in running the practices. Promotes touches, scoring, passing and individual improvement. 30 minutes of official game play. The program will begin on the week of May 27th and will run for 10 weeks. This is a development program. It is intended for player development and therefore we do not keep scores, stats or standings for this group. Teams will play different teams each week. A schedule will be released prior to the start of the season. Volunteer coach will also be trained, certified and will assist in running the the practices. Other Thornhill fields may be added for season or for make-up dates or if program expands. This is not an official league, so there will be no official scores, stats or standings. Other Thornhill fields may be added for make-up dates or if program expands. The program will begin on the week of May 22nd and will run for 10 weeks. 6 v 6 Games just like at the JCC Maccabi Games. Other Thornhill fields may be added for season or for make-up dates. The will begin on the week of May 27th and run for 10 weeks. Please be aware that all sessions missed due to inclement weather, excessive heat, field issues, etc., will be made up, until July 1st, although we will do our best to make sessions up after that date. All program days are guaranteed, however start times and program length are subject to change +/-3O mins based on player registration and field availability for each division. If the fields are closed or the program is preemptively canceled we will post a pop up notice on the main page of our website by 4pm. We will also do our best to notify parents via email by 4pm in most circumstances. If we do not cancel by 4pm it will up to the discretion of the staff whether or not to proceed with the session. Some coaches may email their teams and cancel after 4pm, while others may not have the access to email at that time. Please remember that while soccer is a sport that is played through the rain, we do not play during thunderstorms, heavy rain or any sign of lightening. We ask that all parents exercise their best discretion before coming to the field with inclement weather outside if the trip to the field is not located in close proximity to your house. Early Bird pricing is available till March 31st. Please be aware that we only accept Credit Card and Interac payment online, so to pay by cheque, please CLICK HERE. Our programs are led by instructors, who are thoroughly trained by our Technical Directors and their senior staff. These staff members will follow and teach a curriculum that is catered to improving the skills and development of each player, in a recreational setting. This is a once a week program that has been created and priced in the house league style, and is not a Rep/Elite program.